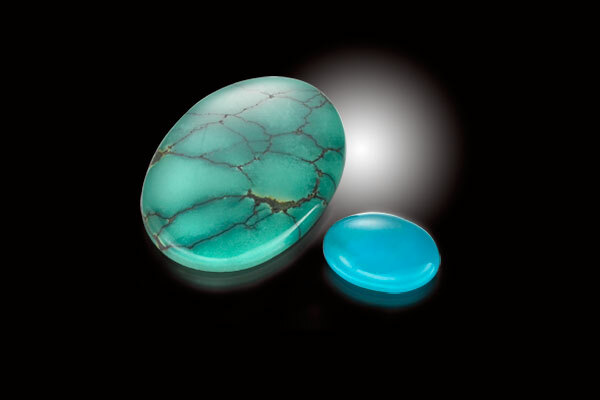 Hindu mystics believed that it was lucky to see a turquoise on the first night of the new moon. The person who sees that gemstone immediately after looking at the moon will enjoy great wealth. The name, Turquoise, began to be used in the 13th century and it means Turkish stone, because the gems came to Europe along the Silk route. It was mined in the Sinai Desert in Egypt from the earliest times and used in jewellery, amulets and also for cosmetics. These mines were exhausted by 4000 BC and now turquoise is mined in Iran, Afghanistan, China and Israel. It is also found in New Mexico where the Indians regard the stone as sacred and carve it into heart shaped amulets. Up until the 17th century, turquoise was worn by men – rarely by women. It was believed that it had the power to protect the wearer from broken limbs. It was also used on the bridles of horses to make them surefooted and in ancient Samarkand turquoise was called the “horse amulet”.